Size: 3x12" + 3 x 10" + 3 x8"+ 3 x6"
☞ Inserting the expander through large aperture on the top of the lantern. ☞ Press the expander and insert two convexes into two eyelets. This procedure should be handled very carefully to avoid convex breaking the paper. Pls contact with us without hesitate if you have any questions about the item or our service. Thank you for visiting,have a nice day! ★SETS CONTENT - Paper lanterns sets come with 12pcs powder white paper lanterns to hang up in your party, you can also insert a mini led light inside the lanterns and it will work perfect (mini led light not included). 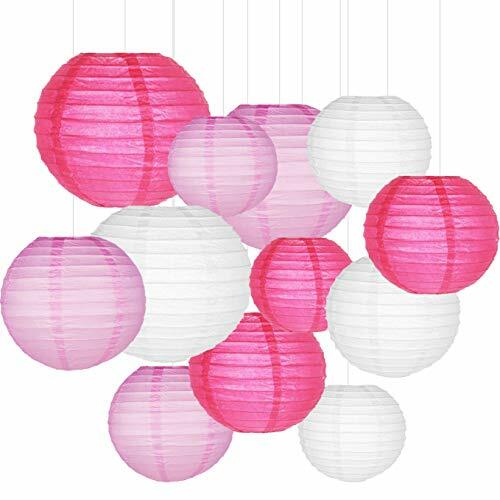 ★ASSORTED COLORS AND SIZES: The paper lanterns come with 3 vibrant colors in sizes of Size-12 " 10" 8 "6",Color- Rose, pink, white.Each paper lantern has been packed individual with instruction makes you easy to assemble and hang. ★REUSABLE AND EASY TO ASSEMBLE: paper lanterns expanding with a metal frame,paper lanterns could easily be stored and used multiple timesyou can fold these paper lanterns easily and store them for next usage. ★PERFECT FOR: Powder white paper lanterns is a perfect decorations for Halloween, Christmas, Valentine's, Mardi Gras, custom parties, wedding, birthday, baby shower, festival, holiday, celebrations, home décor. ★100% CUSTOMER SATISFACTION GUARANTEE - Use our paper lanterns to make your party a MEMORABLE day! !When you're happy, we're happy! Buy with the confidence of our Satisfaction Guarantee. If you have any questions about this product by Sonnis, contact us by completing and submitting the form below. If you are looking for a specif part number, please include it with your message.